The issue begins with an intriguing guest editorial on the spiritual side of medieval stained glass by scholar/artist Richard Lannoy. 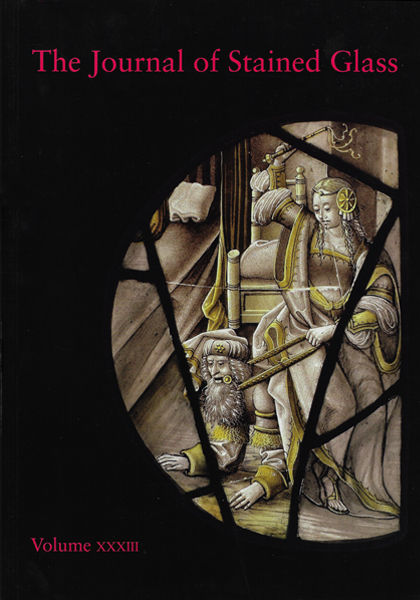 Fully illustrated accounts of the stained glass collection of the Walker Art Gallery in Liverpool and of little-known but important Continental stained glass at the Royal Clarence Hotel in Exeter. Insights into London glass-painters between 1660 and 1710 and the revival of Gothic glasspainting in the work of Joseph Hale Miller. Stained glass in the Australian studio of Donald Taunton for John Hardman & Co. is examined along with a study of studio life in early 20th-century America with artist Wilbur Herbert Burnham Sr. Author Dennis Hadley adds a postscript to his previously-published work on William Glasby. Contemporary Practice features new commissions by Mel Howse for Sainsbury’s, Ruth Taylor Jacobson for the Schonfeld Square Synagogue and Helen Whittaker for the RAF Club in London. New work by BSMGP Fellows and Associates and annual Glaziers prizes and awards round out the section, while Technical Inquiry explores how a 110-year Brangwyn & Tiffany design was newly created. Plus 18 book reviews and highlights of stained glass at auction, an appreciation for Lawrence Lee FMGP on his hundredth birthday and an obituary for Kerry Ayre. In the Gothic Revival Tradition: Stained Glass Windows in Sydney designed by Donald Taunton for John Hardman & Co. The ‘Autobiography’ of Wilbur Herbert Burnham, Sr.